Oh, March. You are but a distant memory. I think there was the conclusion of a basketball season. Wait, actually that came in February. A six-win campaign for the AU Eagles came to a close. You know things aren't right when you have nearly as many concussions during a season (5) as wins (6). There's no need to relive that head-banging misery (pun intended). This past season — heck, the last two years — have been awful for the AU Eagles. But now, there is every reason to hope — to hope and believe that this team, this program, and this beleaguered and oft-criticized coaching staff see a light out of this dungeon of dispair and that AU basketball will be back to winning double-digit games, to finishing in the top half of the Patriot, and to competing for league championships. Don't get me wrong — this is all talk until we see something on the court. This means NOTHING on June 2. But everything that's developed since that final game — since that Sa'eed Nelson epic performance — gives reason for optimism, the opposite of what we felt a year ago when a spate of transfers had the Eagles scrambling to even fill a roster. Sure, Drew Lamont showed flashes last year before sustaining a season-ending, you guessed it, concussion. But he was a wing who could hit a shot here or there on a team of wings who could hit a shot here or there. He didn't stand out. Marvin Bragg getting more of Lamont's minutes isn't a bad thing. I'm moving on. James Washington isn't a big loss, either, for a team now swimming with shooting guards. According to reports, Mark Gasperini (remember him?) is back playing with teammates. He is finally past all the effects of that October concussion, a nasty elbow to his head sustained in practice. The first three months of the season were the worst because there was hope he might return. The Eagles might have their dynamic point guard-big man duo. It never happened. Finally, all hope was lost. There was talk that Gasperini might leave. Were his bonds with teammates the same? Did he want to return to a team that finished in the league's basement? The answer — a resounding YES. AU has its big man. He is healthy. Meanwhile, 6-3 combo guard Jacob Boonyasith's late commitment is important for an entirely different reason — shooting. While American slightly improved its perimeter marksmanship in 2017-18 (33.7% compared to 31.8% the year before), the Eagles are still a below-average shooting team and need more. Boonyasith (a 40-percent 3-point shooter) provides that. Here's some homework for you — has American ever gotten a transfer from the Big Ten 10? The Big 12? The Pac 12? 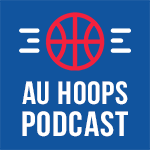 My memory has returned to remind me of Troy Brewer and Charles Hinkle of the SEC — two standouts who did big things for the Eagles — but has anyone else from a major conference come to AU? Regardless, the transfer of Jamir Harris from Minnesota — helped, it seems, by Mike Brennan having played high school ball with his dad — can't be understated. Harris will sit out this season but practice with the team, push the team, and learn the system. Then come 2018-19, imagine a lineup of Harris with Nelson, Gasperini, Sam Iorio and maybe Alexander? That could be potent. The 6-2 Harris wasn't a bum at Minnesota, either. This is a guy who scored 16 points vs. Penn State, who played 15 minutes a game, and who shot a respectable 34.6 percent from three. Harris was the fourth-highest prospect in the state of New Jersey in 2017. A high school career that good can't be a fluke. There's no equating him to AU's transfer flops from George Washington. Harris will be a difference-maker when he plays, should be a valuable asset this year, and it can't hurt future recruiting that AU got a transfer from the Big Ten. Huge. American brings back the best point guard in the Patriot League and the first or second best sophomore in Iorio. Every role player returning took their lumps, but the freshman-to-sophomore jump can be big and usually happens with good coaching. I'd expect an improved Marvin Bragg, CB Diallo, Jesse Little and Stacy Beckton Jr. to provide a strong bench unit. Larry Motuzis took on a lot in his first year with the Eagles and will have much more space to work with to get to the hoop and also spot up as a probably low-minutes starter. Any way you look at it, if this team is able to stay healthy, it's probably 10 deep. A solid 10. It's hard to believe, but Yilret Yiljep, aka Y.Y., has been medically cleared after the enlarged heart condition that effectively ended his career following his freshman season of 2013-14. But apparently he's working with American and the NCAA to get cleared to play as a graduate student. Stay tuned. The 6-7 forward would provide more frontcourt depth and experience for a team that will still be relatively young. So here we are, at the beginning of the June, with reason to truly believe that these Eagles — if healthy — will be much, much better this season. And potentially really good a year from now. Things still need to be worked out. The pieces still have to fit on the court. But just visualize Nelson and Gasperini running high pick-and-rolls with Iorio and Motuzis bombing 3s from the wings, Alexander grabbing offensive rebounds, Boonyasith coming off the bench to provide firepower, and more, and the future could be bright. That's a vast change in perception from March. Remember March?